Description: this second hand airframe of Jetairfly was leased from Fly Dubay. 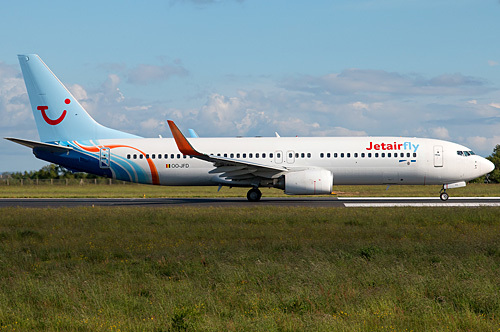 It arrived in previous operator markings as "A6-FDC" at Brussels on May 6 2014, the next day into the Belgian register, was partly repainted with JetairFly titles and tail logo, and became operational from May 17 onwards. Final flight was made on September 27 of the same year, again reverted "A6-FDC" three days later and the same day again heading to its owner Dubai base.